Austin Hip-Hop Scene: Afrofreque - Lamberts - February 9, 2008 - Free Tickets! 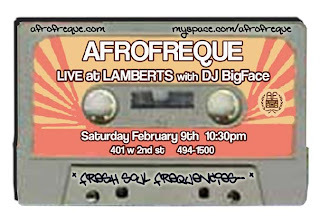 Afrofreque - Lamberts - February 9, 2008 - Free Tickets! From the giving away free tickets, read below department... Afrofreque @ Lamberts on Feb 9th with DJ BigFace. This is perfect, I'd go early and get some good barbecue and stick around and get some soulful hip hop, food for your ears! Daysha of Earthbird Music is giving 2 free tickets to the Afrofreque show for Austin Hip-Hop Scene readers! First 2 to email me @ emptyonline@gmail.com can bring themselves and a guest! Thanks Daysha! Afrofreque will be stirring up a funky stew of live, soulful hip hop with DJ BIGFACE at Lambert’s on Saturday, February 9th, 2008. In the next saga of all things that cause a booty to shake, John Siebenthaler lays down a funky bass groove that can only be matched by the force of one Fumi Sugawara and his magical mastery of the Wah. Will MC Tigre Liu bring Illumination to packed house of reggae, soul, and hip hop lovers? Will Resinthol’s scratch on decks of vinyl have any effect on Lambert’s beautifully crafted wooden floors? I think so, my friend. The floors will bounce as the celebration of soul infectiously spreads through the upstairs bar. Lambert’s is located at 401 W. 2nd St. in Austin, TX. Cover is only $5 at the door. This is a 21+ event. Afrofreque’s music is live soulful hip-hop, with elements of electronica, afrobeat and reggae. The grooves are funky and the lyrics are positive and conscious, reflecting hip-hop culture, social issues and just plain having fun. Afrofreque is known not only for their for their tightly arranged hip hop and soul compositions, but also for their high energy live performances and and ultra funky live improvs. The group, headed by MC Tigre Liu, is an experienced and talented bunch. Band members are/have been integral parts of other bands such as The Killer Bees, Big Game Hunter, Dirty Wormz, Patrice Pike, David Garza, Laura Scarborough, Raggamassive, Futurelight Sound System, Pressure, and Shantytown Underground.